Annual Piano Sale - Misc. It's almost becoming a annual gadget by now. 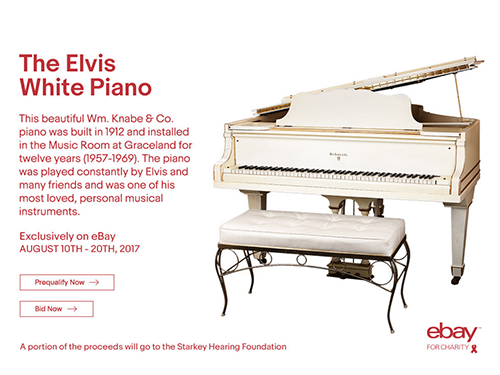 Elvis' "Boy White Baby Grand Piano" will be auctioned on eBay. Parts of the proceeds are donated to the Starkey Hearing Foundation, which provides hearing aids to needy children and adults around the world. The auction of the piano by eBay for Charity will start on Friday, August 11, 2017, 02:00 am CET and end on Monday, August 21, 2017, 02:00 am CET. nice story behind this piano, Elvis could have bought any but he wanted this one. Shame Vernon sold it off, should be back at Graceland.